Ms. Spriggs is the co-founder and owner of Belleville Counseling Associates. She specializes in trauma issues, anxiety and depression, grief, and anger management. 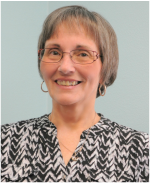 Linda has a special interest in helping individuals with Dissociative Identity Disorder and adults with a history of childhood sexual abuse. She works with individuals and couples ages 12-90. Linda has been working in the mental health field since 2002. She also offers spiritual support through Christ-Centered Counseling. “I believe in the power of faith to overcome challenges and want to help clients find their path through life’s difficulties.